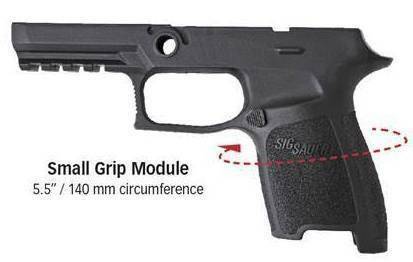 The P250®, a modular pistol that allows the shooter to change caliber and size at will.... The SIG SAUER® P250 was designed specifically to address the future needs of the military, law enforcement, and civilian shooters around the world. The P250 is available in the most popular calibers (9mm, .40S&W and .45ACP). The P250's innovative design enables the shooter to quickly remove the functional mechanism and place it into the polymer grip of his choice. This allows an immediate change in caliber and size;(subcompact, compact and full). And after any change the pistol delivers both outstanding accuracy and reliable functionality. Its modularity not only provides incredible ease of maintenance, but also provides a solution for accommodating different hand sizes - there are 6 different ergonomic combinations for each size, accomplished by changes in grip circumference and trigger style. Now you can own the world's only modular shooting system globally engineered to deliver the "To-Hell -And-Back-Reliability" you've come to expect from Sig Sauer.